All products are manufactured in POLYRIB a tough, twin walled, lightweight, fibre free, fluted PP in a variety of colours. Polyrib is hard wearing, water resistant and non toxic. It cannot rust, corrode or support bacterial growth. Suitable for a wide range of packaging and storage applications. 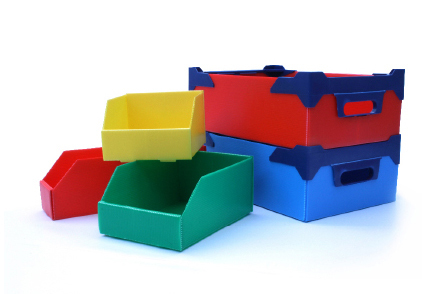 A large selection of standard box and tray sizes and styles are available. Special sizes made at low tooling costs. Boxes and trays can be knocked flat where space is at a premium. Ideal for use in clean rooms for the handling, use and transit protection of easily damaged product. Shelf bins and trays make maximum use of shelving and available floor space. Ideal for use in almost all industries and organisations. Stacking boxes for stock storage, internal handling and document filing. Suitable for hospitals, libraries, schools, factories and warehouses.